NOVEMBER - 1. Annual General Meeting. An enlarged committee was elected, to be led by incoming President Ian Kendall. The enthusiastic new committee met and discussed the way forward. The emphasis will be research for 2005-2006. 2. All day with Lady Teviot, President of UK Federation of Family History Societies. Topics for the day were census returns, workhouses & baby farming in the 19th century. More than 40 genies from Blue Mountains and surrounding regions were held spellbound by Lady Teviot's detailed knowledge and anecdotes from the past. Her talks outlined the availability and limitations in locating certain information and were particularly helpful for those researching within the period. Anecdotes such as particular cases of baby farming enriched our knowledge of England in the 19th Century. Members were pleased to have so many family historians from other areas join with us on the day. One cannot measure the increased interest and enthusiasm of the day, not only from Lady Teviot, but the discussions between participants during morning tea and lunch. President Ian thanked Lady Teviot and presented her with a gift in appreciation. DECEMBER - Friday 9th - Christmas outing to Mount Victoria - to view and lunch at the historic Hotel Imperial and a walking tour of Mt Victoria, once known as One Tree Hill. What a wonderful outing it was! Members were enthralled by the history of the heritage listed hotel and its surroundings, inspected the building, enjoyed a delightful buffet lunch in the dining room with its wonderful stained glass window and finished with a short walk through the park past its concrete oddities which housed a small zoo until the 1960s, around the streets past the The Manor (once Cooper's Grand Hotel) back to the historic Mount Victoria Railway Station. BMFHS volunteers were not on duty in the Springwood Library from Friday 9th December until Wednesday February 1. However would be researchers came - and so many local members assisted. FEBRUARY - Friday 10th. BMFHS had its first meeting in the upstairs hall of Springwood Civic Centre. All agreed the accoustics were better than in the lower hall we had used last year. The speaker was Danielle Embleton from Penrith Library. Danielle, a Mountains resident, told us of the treasure trove of family history resources stored in Penrith Library - fiche, and films and readers are in the main library. In addition there are so many additional resources in the Resources Room open daily from 2pm to 5pm. The indexing of Nepean Times is continuing and Danielle showed examples of the gossipy style of the journalists of the day. What a wealth of information is just " down the hill"! Penrith Library will be holding its 5th Annual History Conference on March 18th - The Makings of a City: Kings, Councillors & Colonial Things. Their new photographic database will be launched at the same time, thus making so much more material accessible. MARCH - Friday 10th. Dr. Ken Gray, volunteer at State Library, gave an overview of the records held there. So many of us use State Library but do we make the best use of it? Undoubtably not because we were unaware of all it holds. His talk was well illustrated by photographs. Friday 24th The first social outing for the year was a well attended tour of State Library to familarise ourselves with their resources. APRIL - Friday 21st Note the changed date as the second Friday was Good Friday. The speaker was John Mormon from the Department of Veterans' Affairs, another great source for family historians. John is an historian with a particular interest having written his thesis on Kokoda Trail of WW2. His talk illustrated the material available as he traced his way through the several sons of one family in the First World War - at Gallipoli and the Western front. We now know much more about what may be available for research and how to go about it. John introduced us to the Veterans' Affairs website and its excellent presentations of the diffeent theatres of the world wars. MAY - Friday 12th. Rhonda Bolden's topic was the Sydney Harbour Bridge and her memorabilia was displayed - more than 2 large tables worth - and she did not bring it all! Rhonda's detailed knowledge was enhanced by members who added information on their relatives who were associated with the building of the bridge. JUNE - Friday 9th. Lindsay Allen from State Records at Kingwood was the speaker. He kept us enthralled with the range of materials held, most not indexed yet, and hints about what to ask about. Last year's visit to SRNSW at Kingswood was such a great success another was planned for July. JULY - a busy month - Friday 13th. Local bookbinder Greg Martin explained the old processes of book construction, passed around samples of book leathers etc, and illustrated his talk with examples of his work, mainly from the Camden Park Library. The range of materials and the different methods used in book construction in different time periods were an eye openinbg to members. We were fortunate to have Camden Park archivist Alan Robinson present also. THE WONDERS OF FAMILY HISTORY was held on Saturday 29th July in the Presbyterian Hall, Macquarie Road, Springwood. The seminar highlighted Family History Week which began the next day, and then led on to Save the Census Week. 1 Cultural Heritage Strategy of the BMCC - Professor Barry Reynolds. 2.Hotels and Inns, Tracing People and their Stories - Paul Innes - a history researcher and guide at two historic mountains hotels, the Carrington Hotel, Katoomba and Imperial Hotel, Mount Victoria, & mention of the Hydro-Majestic, Medlow Bath. 3.Real Property Packets - Gail Davis, Senior Archivist, Access and Information at SRNSW, Kingswood. 4. Scottish Records and Scottish Immigration - Ray Thorburn, Director of the Australian Genealogical Education Centre, Kiama. Family History Week - many thanks to Lynne Tocher and to her sub-committee who met, discussed photos etc made available by members and decided on the displays for the 6 Blue Mountains libraries. The theme - In Grandma's Shed was planned to arouse interest. It certainly did! AUGUST - Friday 11th - John Partridge on the History of NSW Gaols - and what an excellent overview that was! John answered many questions about what was available, and where. SEPTEMBER - No guest speaker. The revised constitution was finalised, followed by a Q & A session. OCTOBER - Friday 13th - Henry Chan's topic was"Finding a Chinese in Your Family Ancestral Closet! That's Just the Start of Your Research Problems." Henry's talk was well illustrated with slides of his ancestral area in China, family interets in New Zealand and the difficulties faced in researching Chinese migration. An interesting aspect was how frequently Chinese migrants made journeys to their ancestral roots. NOVEMBER - 10th A.G.M. TIME AGAIN! DECEMBER - 8th The end of the old & beginning of new year were offciially marked by a well attended Christmas function combined with our 20th Birthday party. 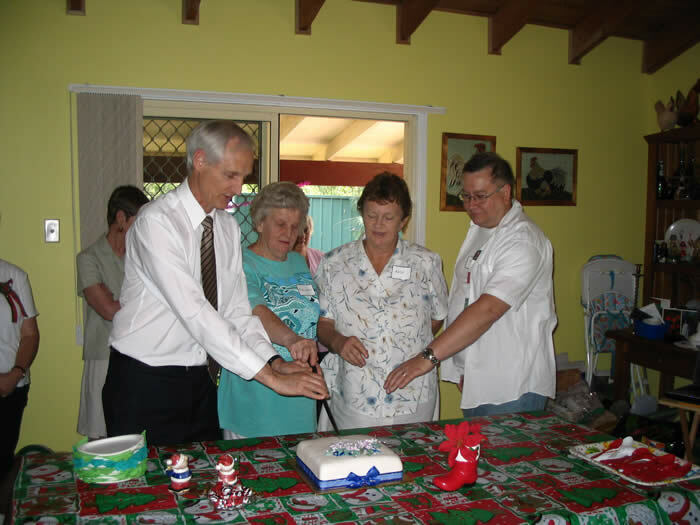 Our Patron & Federal Member, Kerry Bartlett, joined us for the cutting of the 20th birthday cake. Kerry (left) with Mararget Allen (Member No. 50), foundation member Kath Ivan (Member No. 10) and President Ian did us the honour of cutting the cake.